Ticket sales have ended. However you can still visit us for free. We would only not be able to provide you with free lunch box. Under the Tagline “Programming a Sustainable World” the Research Institute of Cryptoeconomics together with the Regional Centre of Expertise for Education for Sustainable Development have started a partnership to explore how Blockchain Technologies can help us reach global sustainability goals. As part of our activities we are organizing a conference – [UN]BLOCKED – where we want to showcase best practices that emphasise the link between Blockchain and the SDGs. Startups and other projects will have the opportunity to showcase their ideas in an open space next to the conference room. 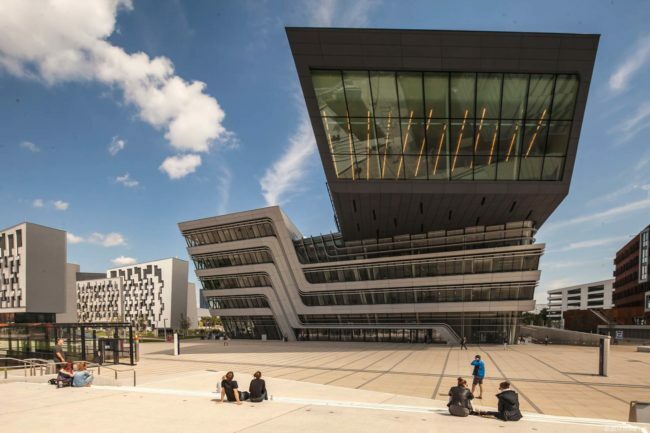 This open space is in the library building designed by the late famed architect Zaha Hadid; the flagship building where many students and researchers flow through. Conference visitors will have long breaks between the sessions providing ample time to interact with the Start-ups and projects. If you are interested, please pre-register. The second day is invite only. We will conduct workshops with selected projects that are interested and mature enough to conduct pilot projects in cooperation with our partners. If you think that your project fits into the concept send us an email with a short description. The countries in focus for the pilot projects are Bhutan, Albania, Kosovo, Moldova, Armenia, Georgia, Burkina Faso, Mozambique, Ethiopia, Uganda, Palestine.